There are often times that I see interesting tattoos but the opportunity to speak to their hosts is not ideal, so I make peace with the fact that featuring them here is not meant to be. If it's meant to be, I believe, we shall meet again, even in a city of seven million people. 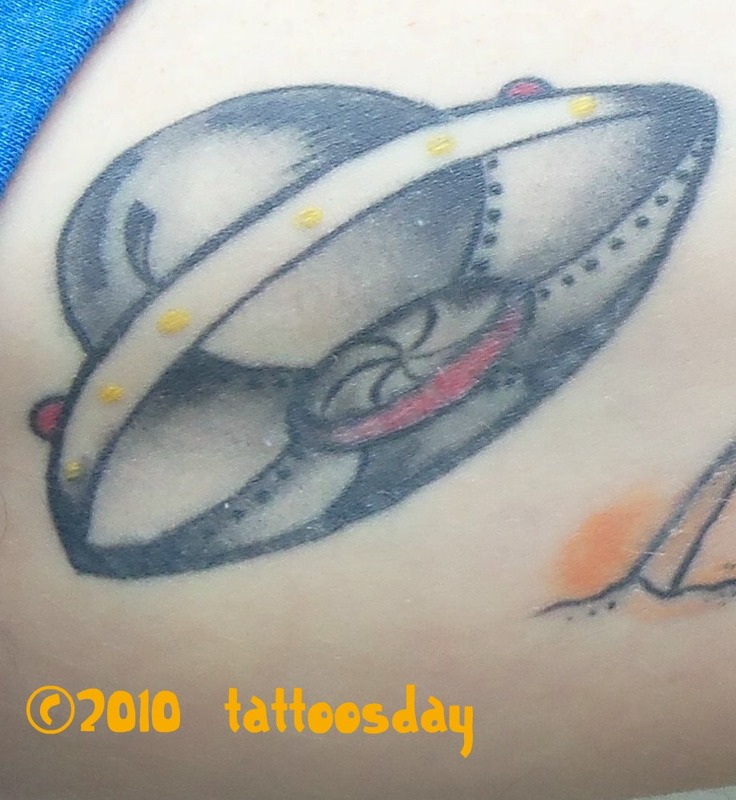 This may seem silly to some, that tattoos are fated to appear on Tattoosday, but one example amazes me and makes me wonder. On October 12, I planned to sell a couple bags of books at the Strand Bookstore. I left my office on 31st and 7th and headed east down 31st on the north side of the street. Halfway down the block I noticed the guy walking in front of me had tattoos. It was when he took off his jacket or sweater that I realized he had several interesting ones. I sighed. I was laden down with books and he was moving at a pretty brisk pace. At 6th Avenue, he turned right, downtown. I shrugged and thought "oh well," and turned left to the north. I walked a block to 32nd Street and entered the Subway at Greeley Square. I caught the train to 14th Street/Union Square and came out on 14th and Broadway. I walked two blocks south to the Strand at the corner of Broadway and East 12th. I stood in line for a bit, and then met with the bookbuyer who gave me a fair price. I left the store, heading north on Broadway, crossing the street and depositing the money I had just received for the books at a Chase ATM machine. I exited the vestibule and headed back to Union Square. I had just crossed East 13th when a familiar face passed me. Rather, familiar tattoos. I whirled and caught up to the guy I had seen 18 blocks and 2 avenues away, approximately 1.1 miles, according to Google Maps. I thought the odds of seeing him again so soon were too great not to interpret it as a sign, I was meant to speak to this person. 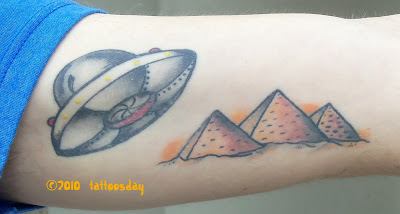 This tattoo represents Aliens building the Pyramids. Mike is into conspiracy theories and the mystery surrounding the construction of these magnificent structures continues to stir the imaginations of humankind after thousands of years. The tattoo itself was a two-part construction. The flying saucer was the first to be inked. The artist was James Hamilton at Love Hate Tattoo Studio in Miami. Love Hate, for those who don't know, is the shop featured in the show Miami Ink. 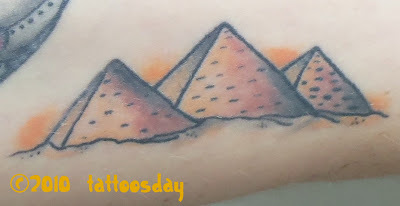 The pyramids were later added by Jason Hoodrich at Code of Conduct in Chicago. Thanks to Mike for sharing these cool tattoos with us here on Tattoosday!